Having been spending the recent weeks with my hands in the dirt, I decided it might be time to get all heady and attempt to apply David Holmgren's 12 PC Principles to the art of natural building. For those of you out there unfamiliar with Holmgren's Permaculture: Principles and Pathways Beyond Sustainability, it is a deeply considered work built around a framework of 12 principles which apply to designing from a systemic (as opposed to linear) understanding of the world. Although already a fair way into the design spiral, I've found it useful to reflect and see how these principles apply to a fairly novel earth building project. Observe and Interact- The original site that was considered for the dome is at the base of a south facing slope with a stand of immature Eucalypt trees uphill. Knowing that gaining sufficient sunlight for passive solar heating and good drainage for mitigating runoff from the slope would be necessary, time was spent observing the site. Movement of the sun was tracked, and after a small rainfall event of 20-25mm occurred, some test holes were dug. Through this interaction with the site we were able to see the large amount of water that was held in that location, leading us to seek an alternative site. It definitely paid to take the time to look and play. Catch and Store Energy- One of the essential elements in any building aiming for an ongoing low-energy budget is passive solar design. In a nutshell, this involves creating a structure that contains thermal mass (materials such as rock/rammed earth/concrete that hold heat) with correct window position and eave length to allow winter sun to enter whilst denying the harsher rays of the summer sun. Such an arrangement permits the heat from sunlight to be caught inside the envelope of the building (which should be well insulated) and stored through the day, being re-released on a cold winter's night. Obtain a yield- As is fairly typical after establishment of a new system (perennial orchard, financial investment) yields can be difficult to harvest in the early stages. There is definitely a personal yield taken in terms of the satisfaction of doing a project whole heartedly yet this won't pay for dinner (or drinks). With respect to natural building, some monetary yield can be taken from workshops/training and sponsorships. With a growing mass awareness of ecological issues, there are definite resource streams that can be tapped into if working in a sustainable way. I see spending the time to get experience in this area, without instant financial remuneration, as the initial growth phase of a tree which will reliably produce fruit for years to come. Apply self regulation and accept feedback- By moving the site location from the initial location, we exhibited the desire to stay flexible and accept feedback supplied by the natural surrounds. This may be seen in contrast to conventional building methods which can burn ancient sunlight in order to completely transform the nature of the site rather than working with the natural energies present. Our initial design had a second smaller dome branching off the main one. As we got into the details of design we came to see that roof design would be overly complex if the floorplan had this shape. So self regulation was applied in reducing the scale of the project to one that was more manageable for our level of experience. Use and Value Renewable Resources and Services- At its core, this is one of the greatest strengths of building from earth. The quantity of dirt (subsoil that is, not topsoil) on this planet and the slow cycling through the center of the planet is so great as to be considered renewable. 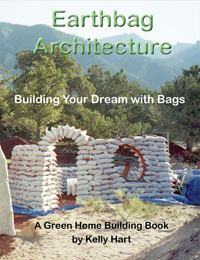 Choosing a building technique that is human scale allows the use of renewable human labor rather than relying on machines built and powered by the very limited fossil fuels still available to us. It's important to add here that non-renewable resources should also be valued and used where appropriate. Using large earthmoving equipment appropriately represents a pulse of power that can save months or years of work for a team of people. I suppose the key here is to respect what this work represents and use it judiciously. To run at full power constantly (like our society) is by its definition unsustainable. Produce No Waste- Using natural materials to build with, such as strawbale for building and clays for plastering mean that at the end of the lifecycle of the structure, the materials are easily reintegrated back into the environment. Waste is only the product of one system that can't be reintroduced into it or used as an input into another system. Building with a living roof reduces water runoff considerably. By holding the water in the soil matrix, the cooling effect of evaporation is transferred into the structure. Using a roof to capture the rainwater for drinking is also an excellent way to convert a waste product (hard to believe that in the worse drought in our history our infrastructure is still so geared to this view of water) into a resource. Seeking recycled windows, doors, timber and other building materials captures a potential waste from somewhere else, using it as an input into your own. Design from Patterns to Details- Planning and design tends to be a top down process, with the actual building being (both figuratively and literally) bottom up. We started with a vision and ethics to guide the design, and worked into the details. Here's an example. Building to provide environmental services. Use hydrated lime preferentially over cement to lessen carbon impact. Integrate rather than segregate- As already mentioned, the original location was very aesthetically beautiful, yet relatively remote. Access for trucks and movement between existing living spaces and the dome would have been difficult. The new location is more integrated into the property and as a result will be easier to build at, and will get more usage. Following on from the Use of Renewables Principle, relocating rather than creating massive earthworks allowed integration rather than segregation. Use Small and Slow solutions- The nature of the building mode necessitates smaller structures. Although walls can be constructed rapidly, hasty construction can lead to sloppy work. In considering this, we committed the full year to the process rather than trying to accelerate the process. Heat from an internal stove, with metal ducting fed through an earth bench or wall is an effective way to heat a space. Use of firewood is very efficient and the majority of the heat is captured by the building rather than being lost to the air outside. Unlike conventional A/C or gas heating the effects aren't switched on instantly, but reach maximal effect after a couple of hours. The benefit is that the heat transmission is more sustained, and felt through conduction and radiation rather than the less comfortable, but more common means of convection. Use and value diversity- Alternative building in general is a very diverse field, lacking the one solution fits all approach of conventional building. This is great, because it allows appropriate selection of a building technique according to climate and local resource availability. By choosing multiple species for a living roof, rather than relying on only one, there is greater potential for resilience in the system. Use edges and value the marginal- One of the main edges/surfaces in a building is that between roof and sky. By focusing on the action that occurs at this point, protection from the elements of sunlight, rain and in some places snow must be considered. In addition heat loss through the roof can be a major contributor to uncomfortable living spaces. Our solution once again is the green roof which, although marginal in its use in Australia, covers all of these factors. I muse sometimes over whether superadobe is actually too far outside the mainstream edge to be a useful contribution at this point in time. I've definitely seen that it takes a lot more personal energy to move an idea forward when its more than half a step ahead of the norm. I suppose I see its inherent usefulness and I'm connecting with enough people out there that see its potential that I keep moving forward. Plus I also have way too much fun playing in the mud. Creatively use and respond to change- Our initial plan was to excavate the entire site by hand due to the somewhat inhibitive costs of hiring equipment and operator for a day, further flamed by my somewhat masochistic (and some would say sadistic) streak. Synchronicity showed its hand again however and on the week when the shovels were getting sharpened we received a call from our earthworks guy who said he would be in the area and wanted to see if we needed anything done. In two hours, he and his backhoe(which he hadn't yet named) did work that would have taken a team of us weeks (months?). Rather than being too attached to our original idea we were able to respond to change. These 12 principles are a major framework underpinning the permaculture training that students at the Permaforest Trust receive. Although I've applied it to a fairly specific situation, the usefulness of this tool lies in its applicability to an understanding of any system and subsequent good design practice. You can see an article by Rob Wainwright about building his dome published in The Owner/Builder Magazine, with lots of pictures of the process.